Describing the history of CERN from its inception in the late 40's up to the mid-60's. The authors have divided these 17-18 years into roughly two successive periods. Volume I deals with the birth and official establishment of the organization and thus covers the years 1949-1954, while Volume II studies the life of the European laboratory during the first twelve years of its existence. Preface. Remarks on the notes and bibliographies. List of archival sources consulted. List of abbreviations. Part I - The Post-War Emergence of High-Energy Physics. From cosmic-ray and nuclear physics to high-energy physics (U. Mersits). Part II - The Prehistory of CERN, 1949 - February 1952. The first suggestions, 1949 - June 1950 (D. Pestre). The fusion of the initiatives, June - December 1950 (D. Pestre). The period of informed optimism, December 1950 - August 1951 (D. Pestre). The period of conflict, August - December 1951 (D. Pestre). The establishment of a Council of Representatives of European States, December 1951 - February 1952 (D. Pestre). Part III - The Provisional CERN, February 1952 - October 1954. Survey of developments (J. Krige). Case studies of some important decisions (J. Krige). Collection of photographs and documents of historic interest. Part IV - National Decisions to Join CERN. French attitudes to the European Laboratory, 1949 - 1954 (D. Pestre). The Italian scenario (L. Belloni). Germany's part in the setting-up of CERN (A. Hermann). Britain and the European Laboratory Project: 1951 - mid-1952 (J. Krige). Britain and the European Laboratory Project: mid-1952 - December 1953 (J. Krige). Part V - Concluding Remarks. The how and the why of the birth of CERN (J. Krige and D. Pestre). 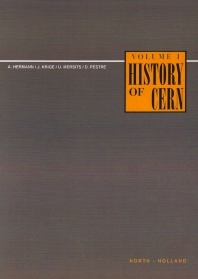 Appendices: Who's who in the Foundation of CERN (A. Hermann); Chronology of Events (J. Krige and D. Pestre). Name index. Thematic subject index.